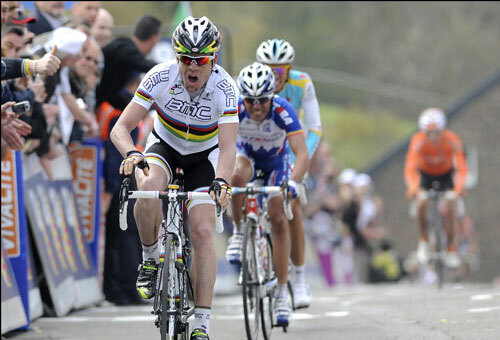 World Champion Cadel Evans (BMC Racing Team) claimed a superb victory in this year’s edition of Fleche Wallonne, coming past Spain’s Joaquin Rodriguez and an impressive Alberto Contador (Astana) for his first victory in the rainbow jersey. Evans said afterwards he had recalculated his strategy after finishing second, fifth and ninth in previous editions of the race – last year he ground up the climb at the head of the field before Davide Rebellin, later to test positive for EPO in the Olympics, slipped past for a questionable victory. On Wednesday, his timing could not have been better. 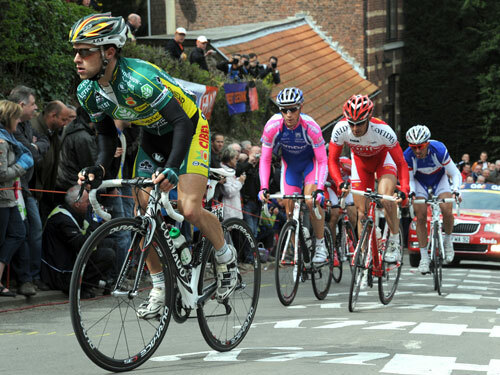 After the peloton reached the foot of the Mur de Huy for a third and final time all together, Andreas Klöden (RadioShack) attempted a long-range attack. 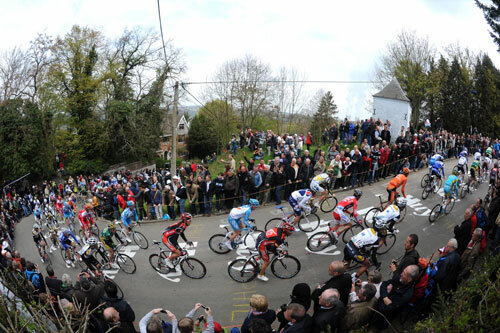 The German’s move was chased down by a Euskaltel-Euskadi led peloton, with their leader Igor Anton spearheading the charge. Contador was not far behind, shadowing Anton up the most difficult part of the climb, but the two never managed to get a major gap. Evans then passed the two Spaniards in the final metres for his first ever victory in a top Classic. The earlier part of the race proved as indecisve as ever despite being toughened up with the second ascent of the Mur coming much later than usual. A five-man break was brought back by the summit, but then what looked like a promising move including Frank Schleck (Saxo Bank) and Roman Kreuziger (Liquigas) never managed to gain more than 30 seconds. An Astana-led peloton brought the race back together for the final ascent of the Mur, although Evans finally profited the most from their work. Evans victory is the first ever for Australia in the first of the two Belgian Ardennes Classics, and as their biggest victory to date is also a breakthrough for his American squad, BMC. As ever, victory in Fleche also sets Evans up as a major favourite for Sunday, although Joaquin Rodriguez (Katusha) has already finished second in Liege last year and will be gunning to go one better after his strong Fleche Wallonne. But whilst Evans and Rodriguez are old hands in the Ardennes Classics, Contador’s result was probably the most surprising. Third in a race the Tour de France winner was only taking part in to gain experience can be considered a major success, and augers more than well for Sunday’s Liege-Bastogne-Liege. 10. Ryder Hesjedal (Can) Garmin-Transitions at same time.